The kids had to fill out the full menu before being served. 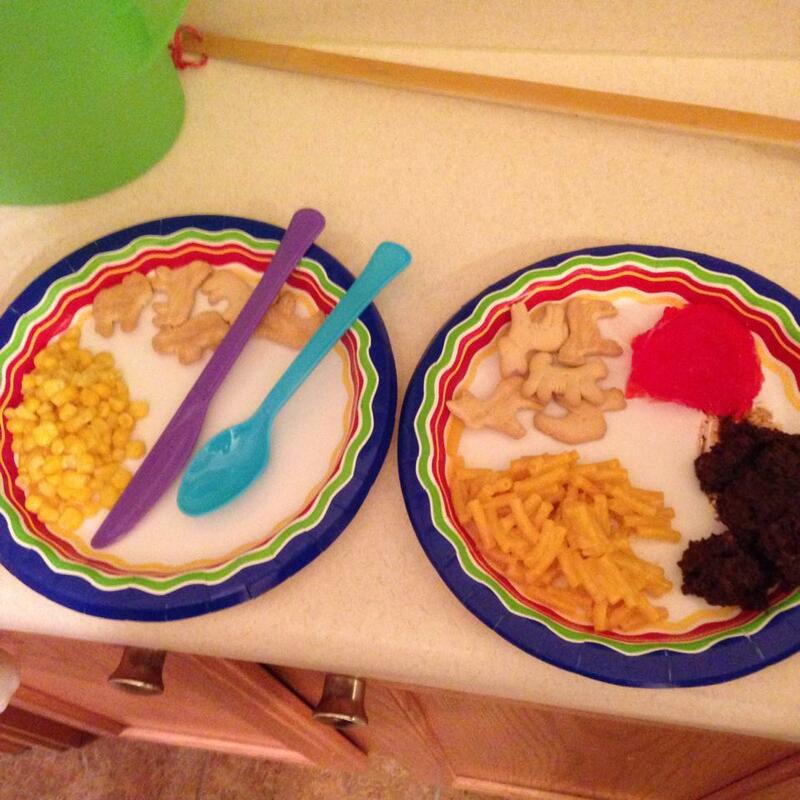 The plate of Jello-O, spaghetti, pudding, and animal crackers with no utensils provided a lot of laughs. Last week we celebrated my daughter’s seventh birthday with a Mystery Menu Dinner Party. It was a huge hit, and parents have been asking me about details of the party, so I thought I’d share. The concept of a mystery dinner party is simple, and can be adapted in a lot of different ways. Each guest is seated and given a menu. Before anything is served, they have to order every item in a three-course meal. In the kitchen, I had prepared 9 foods that most kids enjoy. As you can see, all of this food is easy to make and pretty popular with kids. The trick of the meal though, is in the ordering. Guests have to order everything – including utensils. We provided drinks, napkins, and a plate for each course. The knife, fork, and spoon were added to the menu. Then, all 12 items were given code names. Macaroni and cheese became “Yellow elbows.” A fork was “Farmer’s tool.” Spaghetti, corn, and Jell-O were “Wigglies, nibblies, and jigglies,” respectively. Each guest had to fill out the entire three-course menu at the start, so the kids were surprised by what they would get for each course. Since even the utensils were a mystery, this caused some pretty good hi-jinks. These were the first two plates served of the first course. During our party, one little girl’s third course was a plate of goldfish crackers, a knife, a fork, and a spoon. 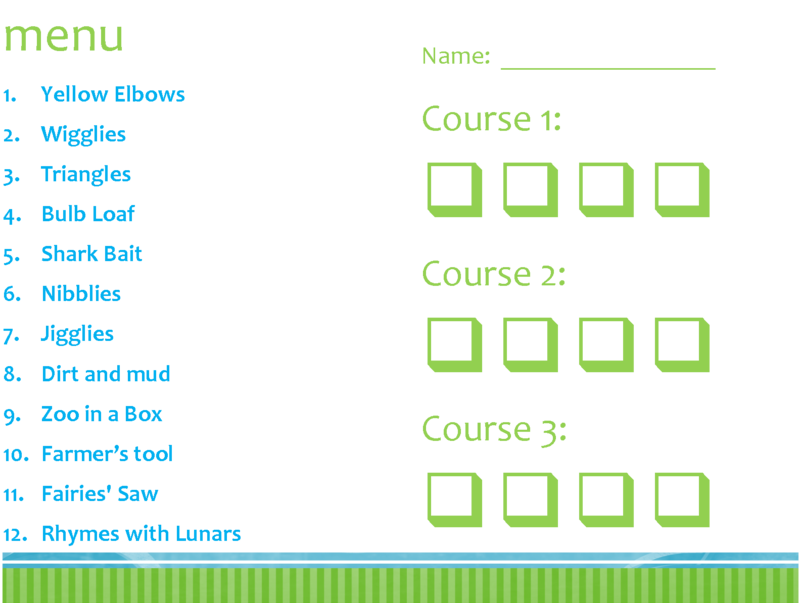 That gives you an idea of what her other courses were. She had a blast. Another boy struggled to scoop up his Jell-O with a butter knife. His giggling didn’t make it any easier. One little girl told her Mom afterwards, “We got to eat with our fingers!” Her Mom told me she couldn’t stop talking about the party for the rest of the night. Really, there are no limits to what is possible. The hardest part of the night was the actual plating. With just my wife and me, it took a little while to plate all 10 kids. Another helper or two would have been good. There are great opportunities to adapt the menu for themes like Halloween, Superheroes, or Christmas. I’m considering coming up with an adult version – with the right friends.